A short walk from Mellieha Town visiting Selmun Palace, Mistra Bay before continuing along the coast to St Paul's Bay. 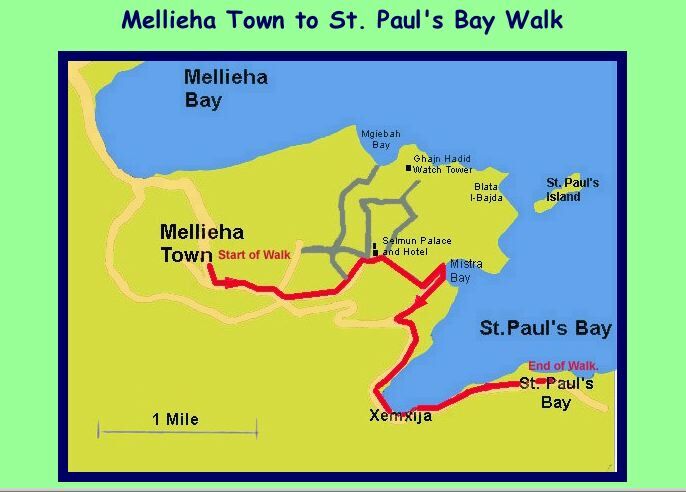 This walk from Mellieha Town took us to Selmun Palace. However, as it was our first walk in this area, we were unsure which way we would go so, like so often on our rambles, we decided to leave the finer details of the walk until later. 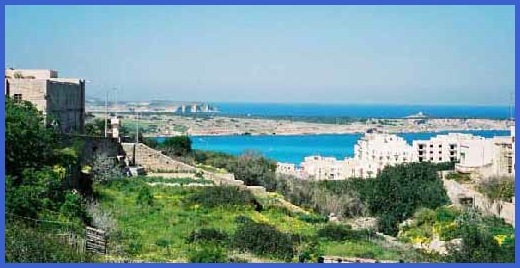 Mellieha Bay and Marfa Ridge beyond, seen from Mellieha Town. After visiting George's Bakery, located at the top of the main street in the town, we took the road going south, passing the Belle Vue Bakery (the other Bakery we found in the town) - NB. On our last visit to Malta in the Spring of 2008 we noted that the Belle Vue Bakery was closed . On reaching the traffic island at the eastern end of the Mellieha Town By Pass a signpost on the left directed us along a broad road to Selmun Palace. There was very little traffic using this road, which was flanked by lots of wild flowers and had views south towards St Paul’s Bay. The sun was out. It was glorious. St Paul's Bay seen from the road leading to Selmun Palace. Soon after passing a small church on our right we reached Selmun Palace, which is perched on top of a hill overlooking St Paul’s Bay. As the details in the map I had with me were not particularly good we asked a couple walking towards us for directions. Although there were a lot of Germans holidaying on the island we instinctively knew that this couple were English. I suppose it has something to do with the way the nationalities dress. Anyway this couple said that we should go to the right of the Palace and in 100 yards or so take a right turning. 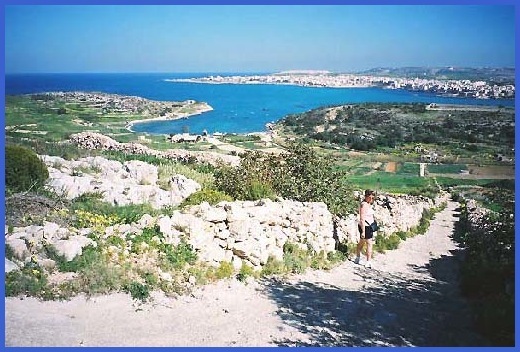 We could then take a path that would lead downhill to a minor road that lead to Mistra Bay. This sounded just what we wanted, so having spent a few more minutes passing the time of day with the couple we followed their instructions. 100 yards, turn right and almost immediately on our left was the downward path. The view from the path between Selmun Palce and Mistra Bay and the narrow downward path. It was very steep but the top part of it had been covered with concrete to give a better surface. At least that’s what I presume it was for. It was just as if someone had got a load of concrete and let it run down the path where it would have soon solidified. It certainly made our downward trek easier. Needless to say we lingered on this path. We could see to our left the old army barracks at Fort Campbell. To the right of this St Paul’s Island, and to the right of this Mistra Bay. And on both sides of us terraces covered with wild flowers which, as we neared the bottom of this descent, were replaced by potatoes and other crops . On reaching the road at the bottom we turned left and in a few minutes were at Mistra Bay. Mistra Bay was very quiet. The one café/restaurant there only opened at weekends and evenings at this time of year. So we sat on a slipway, Anne dangled her feet in the sea, and we enjoyed the cake we purchased from George’s. It was delicious. Unfortunately the only drink we had with us was water but it was acceptable and we sipped it as we sat in the afternoon sun and enjoyed the wonderful panorama. We retraced our steps along the road, which was flanked by various crops. It was like walking through a number of allotments. It was so interesting. Time flew by and it seemed no time at all before we reached the main road between St. Paul’s Bay and Mellieha. Although we could have caught a bus from here we decided to walk the couple of miles back along the coast to St Paul’s Bay. Initially there was no path, so we had to take care as vehicles passed close to us, as we walked to the small resort of Xemxija (not sure how it’s pronounced but I did hear someone call it Eczema). Selmun Palace from the to road to Mistra Bay. The path from the "Palace" to the road can be seen acending diagonally left. However, soon footpaths were in evidence and it became more pleasurable as we strolled down to, and then along, the promenade. However, we had to leave the seafront soon after and used footpaths alongside the road to get back to our hotel at St Paul’s Bay. It had been a lovely little walk. Probably slightly over 5 miles and even the bits of road walking had not detracted from the enjoyment of this sunny stroll.